Monazite. Credit: E. Offermann. Coll. A. Kandblauer, SVSMF. Rare earth elements are a group of metallic elements having closely similar chemical properties. They are mainly trivalent, but otherwise similar to the alkaline earth elements. The group consists of the lanthanide elements with atomic numbers 57 (lanthanum) to 71 (lutetium), plus scandium (21) and yttrium (39). 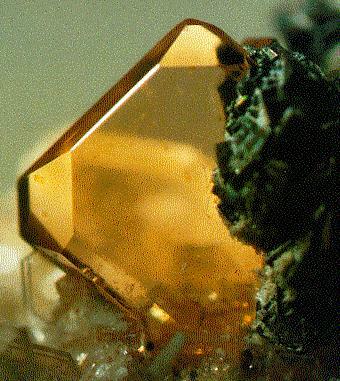 Monazite is a phosphate mineral of widespread occurrence (mined in India, Brazil, the United States, and South Africa) that is the richest source of rare earth elements, such as lanthanum, cerium, and other members of the lanthanide series. It also contains thorium. Monazite occurs widely in granitic and other rocks, and usually forms small brown crystals in the monoclinic system.